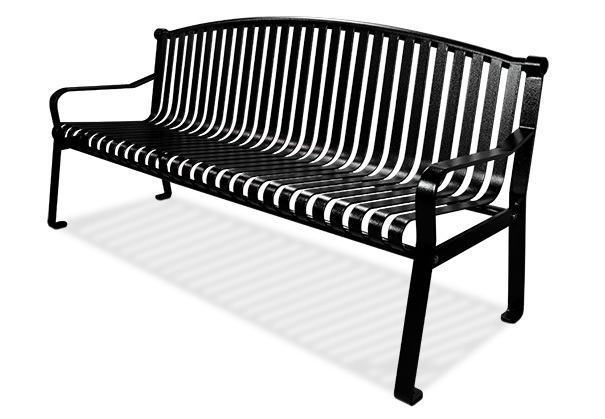 Manufactured to withstand daily commercial use, this high quality imported steel bench features a back and seat made from 1-9/16" x 3/16" welded steel bars. The arms and legs are constructed from 2" x 1/2" steel, which will provide many years of outstanding service. Anchor holes are pre-drilled for optional surface mounting (Expand Anchor Bolts Included) to deter theft and prevent unwanted movement of the bench. Finished with a solid textured powder-coating finish, this fashionable bench is highly resistant to rust and corrosion. Easy four piece assembly using the included stainless steel hardware. ►Need a Park Bench Fast?